Ranks of pipes are called into play by pulling stopknobs at the console. Typically, a stopknob controls 1 rank of pipes with one pipe for each key: 61 pipes (five octaves) for stops in manual divisions, and 32 pipes for pedal stops. Some stops consist of 2 or more ranks; these stops add either piquancy or brilliance. Unlike the piano, which is a percussion instrument, the organ is a wind instrument. When a stopknob is pulled and a note played, the sound continues unchanged until the key is released (or the stop is pushed in and the wind cut off). A 1hp motor supplies the wind (for details about construction, see History). 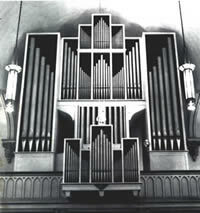 Organs vary tremendously in construction and sound from one century, region, and style to another. To experience this difference, compare and contrast the specifications and sound of Severance Hall's wonderful Skinner, built a quarter century before the Beckerath-and a sonic world away. For more on this, see History. a few ranks sound 1 octave below (16'); many sound at 1 or more octaves above (4', 2', 1'); a few sound at other overtones, as the 12th (3') and 17th (1½'). A Roman numeral indicates a stop that has more than one rank, from 2 ranks (II) to 6 (VI). The 2-rank stops add piquant overtones and a marked timbre; The stops with 3 or more ranks are designed to add brilliance, especially to the lower range of the keyboard. The Pedal is the Beckerath's most powerful division. Most of its ranks work well at several dynamic levels, from quiet to moderate to full. Especially notable is the Subbass: very quiet, it can be felt physically as well as heard. The left tower ("C side") houses the C, D, E, F#, G#,and A# pipes; the right tower ("C-sharp side") houses the C#, D#, F, G, A, and B pipes. The Hauptwerk is the chief or head (haupt) manual division. Its principals and flutes are bigger sounding than those on the other manual divisions. Its mixture is also the biggest and brightest of any manual, with six pipes per note. Worth noting: the Trompet is full yet sweet, and not at all blaring. The Rückpositiv sits on the balcony rail, at the organist's back (rück). In dynamics and function, it is the secondary manual keyboard. It includes the Dulzian, a mellow reed; the Bärpfeife, a quirky and buzzy reed; and the Sesquialtera, a 2-rank stop composed of two overtones that provide piquancy. The Schwellwerk is in a case with shutters that close or open to decrease or increase (swell, schwell) the volume. The Beckerath's only string stops are here: the Gemshorn and a companion rank of pipes (Celeste) tuned slightly sharp to create a halo effect. The other ranks are scaled accordingly, including a smallish mixture and a lovely Oboe.